Hello, Friday!! Hello, Weekend!! The weekend is always a good time to let your hair down and relax a little. 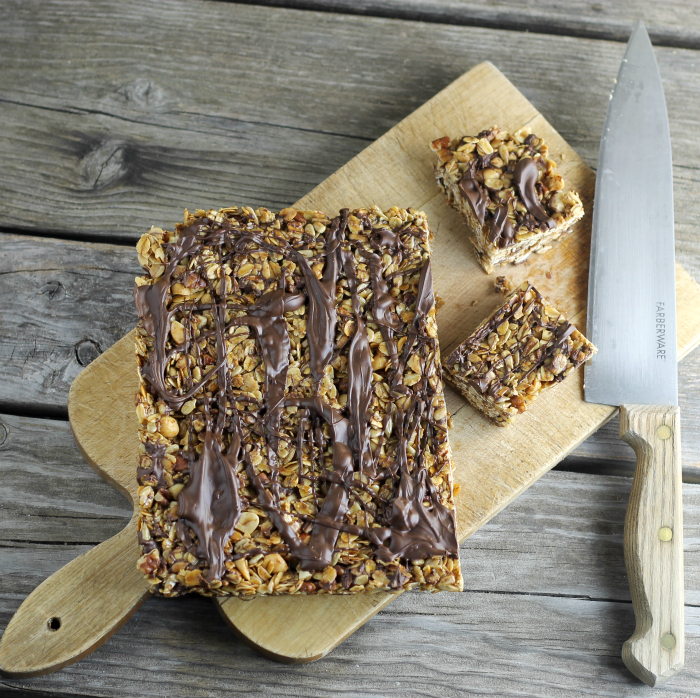 Also, it is a good reason to treat yourself to something special… like these homemade chewy granola bars. I have made granola and granola bars in the past, but these are by far my favorite. 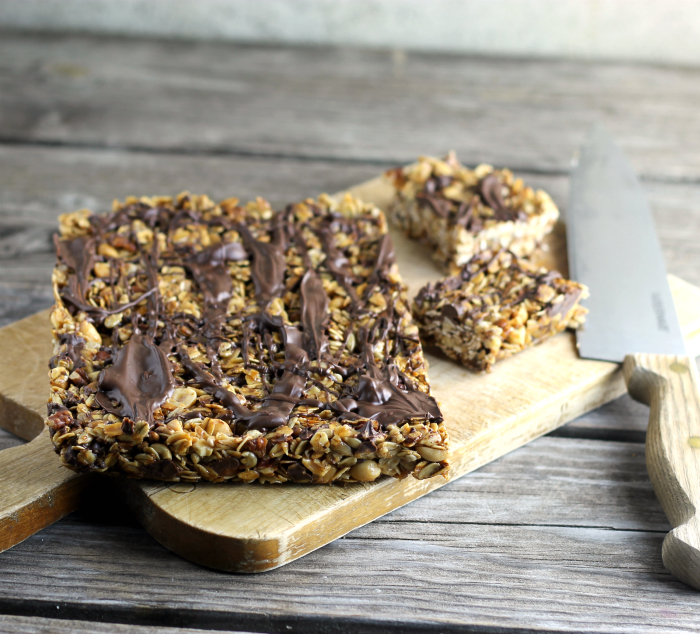 It is amazing how a few simple ingredients can come together to make these chewy granola bars. Granola bars are on our shopping list every weekend. 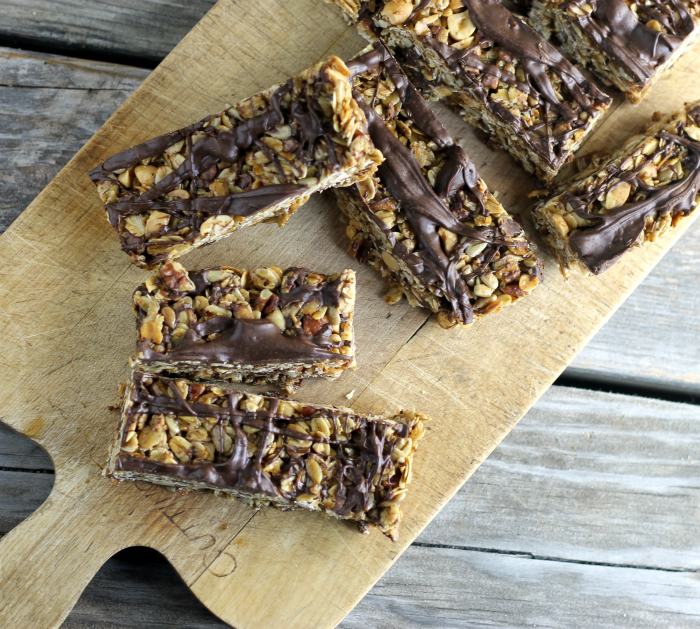 Yeah, we love granola bars and like to take them to work for a mid-day snack. But you never know truly what you are getting with the ones that buy in the stores. That is why these homemade bars are a welcome choice. And did I say that they are super easy to make and tasty too? First I roasted the oats for about 15 minutes, stirring them every 5 minutes or so, you don’t want the oats to burn. While they are roasting, I mixed the rest of the dry ingredients together, the nuts and seeds that are added to these granola bars. I also made the liquid mixture (the honey and coconut oil) that holds everything together. Once the oats have been taken out of the oven combine all of the ingredients and press them into the prepared pan. I bake these bars in a low temperature for about 15 minutes to bring them together, but not enough that they are not chewy. Once they are done baking they need to be cooled and let to set. I like to let them set up overnight. I know it is hard to wait that long, but they are worth it. If you are looking for an easy recipe for homemade chewy granola bars so you can replace those store bought ones that you have been buying I hope that you will try these. Heat the oven to 350 degrees F. Spread out the oats onto a baking dish, a jello roll pan works well. Line a 8 by 8 pan with aluminum foil and spray with a non-stick spray. Roast for about 15 minutes, stirring about every 4 to 5 minutes so that the oats don't burn. While the oats are in the oven chop the nuts that you will use. Combine the peanuts, pecans, and sunflower seeds. In a medium saucepan combine the coconut oil, honey, brown sugar, cinnamon, and vanilla, heat over medium heat until it comes to a boil, remove from heat. Once the oats are roasted remove from the oven and add to the honey and coconut combination. Add the nuts and seeds; stir until everything is coated evenly. After taking the oats out of the oven turn the oven down to 225 degrees F.
Press the mixture into the prepared pan and place it in the 225 degrees F oven. Bake for 15 minutes. While the granola bars are baking, melt the chocolate chips with the coconut oil. Once you remove the bars from the oven drizzle the chocolate over the bars. Let cool completely. You can set in the refrigerator to speed up the process. How much fun are oats to play with? I love them. Been making all kinds of fun combos in my lab. Just so much fun to work with and boy, I love all the goodies you packed in yours. Well done. These looks so delicious, Dawn! And having them being chewy sounds good … They will make a great snack! Thank you for the recipe! 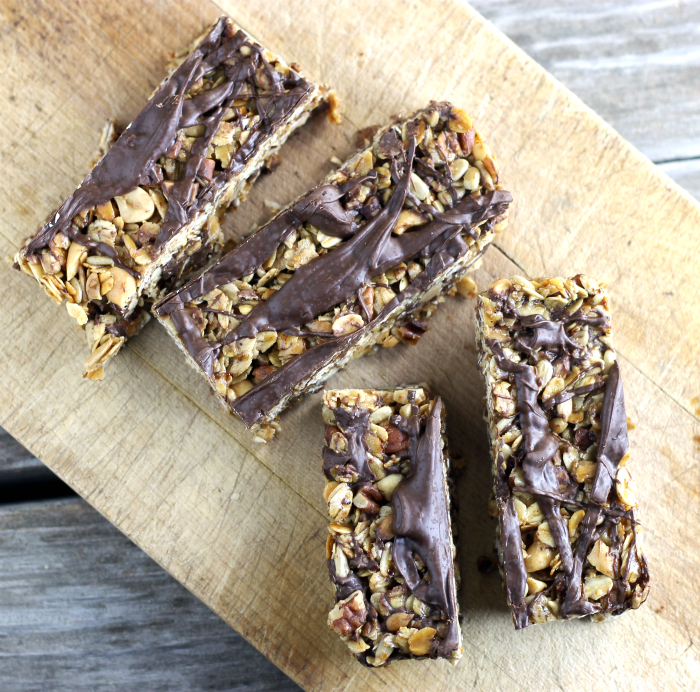 These granola bars look insanely awesome, Dawn! I could seriously go for a batch of these bad boys. We keep granola bars on hand for snacks, and we make our own granola for morning breakfast…so it’s not a far jump to making granola bars. Love this recipe! Hi Dawn, these look delicious, I just happen to have all these ingredients handy, printed, will be making these tonight. These look like just the recipe I’ve been looking for. I’ve shared it on my facebook page to remind me to try it. Thanks for the recipe! Hi Dawn, I happy to hear that you liked this recipe. Please let me know how you like them, once you make the recipe. I hope you will stop back again!! YES Dawn … David is right …”insanely awesome” Thank you. One can vary the contents depending on where in the world one is. I am in Beijing at the moment so pecans are not so easily obtainable, but hazelnuts and walnuts are. Also dried fruits, pumpkin seed, sesame and millet can also be substituted. I personally don’t like peanuts, but there are lots of alternatives … cashews? How long will these stay good for?? They should stay good for about 4 to 5 days. Hi, do you have the nutritional information on the bars? I’m tracking my food intake and didn’t see it listed on the recipe. No, I am sorry, I do not have the nutritional information on these bars.